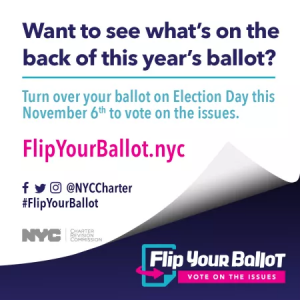 On Thursday, October 25, 2018, Generation Citizen New York City submitted public comments to the Campaign Finance Board endorsing the three ballot proposals on the November 6, 2018 ballot. Read on! GC NYC participated in the 2018 Charter Revision Commission process, including by testifying before the 2018 New York City Charter Revision Commission (Commission) about civic engagement and voting reforms during the summer of 2018. After conducting two rounds of public hearings, the Commission recommended three proposals, which will appear on the November 6 Generation Election Election ballot. The proposals would amend the City Charter related to three specific areas: campaign finance, civic engagement, and community boards. Generation Citizen endorses ballot proposal #1, which would improve New York City’s public financing system by reducing contribution limits and expanding matching funds for small donor contributions. New York City’s public financing system is a national model and these reforms would further strengthen this system by increasing the matching rate for small contributions. This will elevate the voice of everyday New Yorkers in our city’s political process. By lowering individual contribution limits to candidates for City Council, Borough President and citywide office, this proposal will reduce the need for candidates to rely on large donors and incentivize candidates to engage a more diverse group of donors to support their campaigns. These revisions would ensure that more New Yorkers can make their voice heard in our local elections, which will strengthen our local democracy. Generation Citizen endorses ballot proposal #2, which would create a Civic Engagement Commission and expand participatory budgeting citywide. Generation Citizen believes that civic engagement is a spectrum of activities that Go Beyond the Ballot and voting on Election Day. New Yorkers are hungry for civic engagement opportunities and this proposal would ensure that there is a dedicated office within City government to cultivate and connect New Yorkers to those opportunities. While young people are interested in affecting change in their communities, many see participation in local government as being out of their reach. Participatory budgeting gives New Yorkers of all ages the opportunity to engage in democracy and to influence local spending to improve their community. We endorse this proposal because it would engage more New Yorkers in civic life and elevate their perspective in government decision-making, a core value for our work. Ballot Proposal #3: Community Boards – Establish an eight-year term limit and provide more planning resources. Generation Citizen endorses ballot proposal #3, which would establish eight year term limits for community boards and require Borough Presidents to standardize the community board appointment process to ensure boards are more representative of the diversity of the community board districts. Community boards are vital to the City’s local decision-making framework on many issues, including land use, education, quality of life, and pedestrian safety. One of GC’s core values is that democracy works best when more people have a chance to engage in their local government and have a seat at the table. We believe that establishing term limits for community boards will ensure that more New Yorkers can participate in local decision-making, including especially 16 and 17 year olds who are now able to serve on community boards thanks to successful advocacy by GC and other organizations.